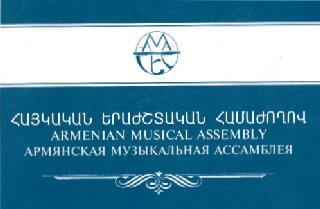 The Armenian Musical Assembly is a public creative organization that was established in 1994. Five composers, including Levon Chaushian, Vahram Babayan, Ervand Erkanian, Martin Vartazarian, Ruben Sarkissian and specialist on musicology, Margarita Rukhkian, have formed a group with the intention of promoting to modern Armenian music. The Chairman of Assembly is Levon Chaushian, the Deputy Chairman is Vahram Babayan. The idea from the very beginning was to combine the work of the Assembly with musician-performers and establish close and fruitful links between composers and performers. Accordingly, the violinist and conductor Victor Khachatrian, the pianist Anah’it Nersissian and vocalist Armen Karapetian became members of the Assembly. The endeavours of the organization have successfully contributed to the quality of life of musical audiences. The establishment of the Assembly and its initiatives were enthusiastically encouraged by Gohar Haroutsunian, the Director of Aram Khachaturyan House-Museum and an Honorary Member of the Assembly. Since then, the new organization has been registered within the museum, which contains a fully furnished Concert Hall of a extremely high quality. The Concert Hall provides only 180-200 seats, but this number is actually enough to begin with and create the regular audience and involve it into the activities of organization aimed at the support of best creative forces of musical Armenia. The respected Consul of Armenian Embassy in Great Britain – Ruben Galichian – is an enthusiastic supporter and has become an Honorary Member of Assembly. The Trust Fund of Essefian Family (England) and Mr. Christian Khachikov (deceased) of Belgium became the first patrons of the Assembly. Concert activity of the Assembly started in spring 1995, when the concert dedicated to 80th anniversary of Genocide was performed on April 25. The first three concerts of the Assembly were given jointly with Chamber Ensemble of Philharmonic Orchestra, conducted by Ruben Asatrian. The concerts were given at the concert hall, named after Aram Khachaturian. The Armenian composers’ compositions and European classical music were performed. These concerts illustrated the guiding principles of the organizers and served as a basis for subsequent development of activity linking remarkable compositions of the past and lively creative work, continuing Armenian traditions and culture. In their undertakings, the Assembly is trying to reflect both the present and the history of Armenian music; to contribute to the development of gifted young musicians and composers; and to propagate the art of the best Armenian performers. In all, 54 concerts have been arranged by Assembly within 1995-1999 period. Moreover, the concerts were given at the time when musical life came to a stand still, as the halls were not heated within period of November -March. Three scientific conferences followed by publication of theses were held under aegis of the Assembly. These were widely reported in the Republican press. The great attention of the musical public was given to concert-meetings with composers Eduard Mirzoyan, and Vazgen Muradian (USA); to jubilee celebrations devoted to composers Ruben Sarkissian and Lazar Sarian; to the classics of Armenian ashug music – Sayat-Nova and Jivani; to concerts of pianist Vahagn Hayrapetion (jazz) and singer Armen Karapetrian /bass; to memorial concert of Avet Terterian and to concerts of Armenian composers’ new works. The cooperation with the Belgian “AMADEUS” Association headed by Hovhannes Anastasian, contributed a meaningful page to the activity of the Assembly. A number of competitions have been held jointly with “AMADEUS”. For example, in 1995 the competition of pianists, violinists and violoncellists; in 1996 – the competition of young composers, and in 1998 – the competition of chamber ensembles, choruses and composers. The collected works of the young composers who became the Laureates of competitions, were published in 1996. Many young people of talent take an active part in concerts of the Assembly and some are provided with founders scholarships. Creative work is the principle purpose of the Armenian Musical Assembly, and the major emphasis is given to the composition of new works. At the request of Assembly, 18 compositions have been written in different genre within four years. All the works have been included into concert pro-grams and are performed regularly. The Festival devoted to the 95th anniversary of Aram Khachaturian became a great event within Assembly activity. The Festival was funded by the “Hayastan” All-Armenian Fund. The music of Aram Khachaturian together with the works of contemporaries and followers, was performed dur-ing four concerts. Personality, time and traditions were the principal ideas of Festival, concluded by theoretical conference and nine lectures. The Festival of Vahram Babayan’s music, including seven concerts, is a further important stage in the activity of the Assembly. This ambitious project was executed due to great enthusiasm of performers both soloists and the instrumental and choral ensembles. Today, we may easily say that the work of the Assembly was of supreme importance in preserving the traditions of composers and concerts during the hard times of art development. To date, the work of Assembly is regulated by the joint action of musical associations, such as the Philharmonic Orchestra under leadership of L. Chknavorian, National Chamber Orchestra under guidance of Aram Karabegian, State Quartet after Komitas, Quartet after Aram Khachaturian and others. The Assembly is intended to renew the musical links with Moscow, Tbilisi and Europe and establish new liaisons. Thus, the Chamber works of Levon Chaushian, V. Babayan, R. Sarkissian, M. Vartazarian were performed by the best Belgian musicians at Big Hall of Brussels Conservatory on March 19, 1999. The works of Jan Beyli, the Belgium Composer, Conductor and the Head of Belgium Conservatory, were performed at concert hall of House-Museum after Aram Khachaturian on November 1, 1997. This successful illustration of creative relationship is our inspiration. We believe that these creative links are the foun-dations on which the development of our musical art is based. And we will devote to it all our efforts and inspiration. LEVON CHAUSHIAN was born on May 10, 1946 in Yerevan. He graduated from Yerevan Conservatory after Komitas, specializing in composition (1969) and in piano (1970). In 1972 he finished the post-graduate courses in composition under the guidance of professor Ed. Mirzoyan. In 1974 he became the State Youth Prize Laureate. In 1983, the Quartet N2 of Levon Chaushian was recognized as one of 12 best compositions of the year at the 30th International Tribunal of Composers, orga-nized by UNESCO in Paris. In 1985, the symphony “To Unknown Soldier” was awarded the First Prize at the Competition of Symphony Works of Armenian Composers. From 1986 up to 1991 Levon Chaushian was the Deputy Chairman of the Armenian Union of Composers. From early 1990 he has been working with symphonic center of Armenian Philharmonic Orchestra. Chaushian’s music is being performed at International Festivals and at the concerts in USA, Belgium, Japan, France and other countries. Levon Chaushian has been the Chairman of the Art Board of Yerevan Symphony Orchestra since 1994. ERVAND ERKANIAN was born on November 5, 1951 in Giumri. He graduated from Yerevan Conservatory after Komitas, specializing composition under professor G. Egiazarian and the violin under A.Vartanian. In 1987 he became the Artistic Director and Conductor of “Tagaran” -ensemble of ancient Armenian music. From 1994 Ervand Erkanian is working under contract in Lebanon and is the Leader of “Gusan” chorus; Chamber Orchestra “Hayastan”; Ensemble of violinists; and Ensemble of ancient music “Madrigal”, Cultural center society “Hamazkain” are also directed by Ervand Erkanian. His music has been published and performed in USA, France, England, Russia, Argentina, Lebanon and other countries of world. MARGARITA RUKHKIAN was born on November 7, 1937. She graduated from theoretical department of Yerevan Conservatory after Komitas. From 1962 up to 1965 she was the musical editor of Armenian Television Company. 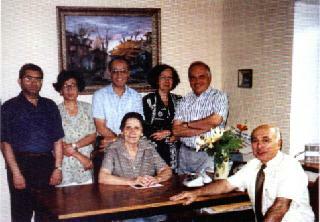 From 1965 up to 1969 she was post-graduate student of Moscow Study of Art Institute, under the leadership of the professor in the history of art – Vasina-Grossman, In 1971, she maintained a thesis “Issues on Formation and Development of Armenian Symphony” and got the candidate degree in study of art. From 1970 Margarita Rukhkian has been a scientist of Art Institute under the Armenian Academy of Sciences. In 1982 she became a Laureate of All-Union Prize, named after Asaphiev for “Armenian Symphony” monograph. Margarita Rukhkian has been the author of many research works and three doc-umentaries: “The Diminishing Music” [ArmenFilm, 1970), “Gorani” (Studio Yerevan, 1977), “Armen Tigranian” (Studio Yerevan, 1981). She is being pub-lished as the music critic and publicist. “Armenian Symphony” monograph, 1980, Yerevan, publ. Academy of Sciences of Armenian SSR. MARTIN VARTAZARIAN was born on April 4,1938 in Yerevan. He graduated from the Yerevan Conservatory after Komitas in piano under G. Saradjev and in composition under E. Mirzoyan. From 1956 up to 1960 Martin Vartazarian was working in Variety Quintet of Armenian State Radio. From 1966 up to 1972 he was the Artistic Director of Variety Ensemble of the State Radio and Television Company of Armenia. Since 1972 Martin Vartazarian is the Artistic Director of Armenian House of Composers. Since 1990 he has been the conductor-consultant of Variety-Symphony Orchestra of the State Television and Radio Company of Armenia. Martin Vartazarian is the lecturer of Yerevan Conservatory, he is actively working with drama and musical theaters and composing music for films. Martin Vartazarian is the Honored Art Worker. Author compositions of variety songs 1981 / “Sovetakan grokh” publ. Collection “Concert repertoire of the pianist” 1983 / “Sovetakan grokh” publ. The fourth W. Shakespeare’s sonnet (in English), 2 romances on the words of Av. Issahakian. Col. B Armenian romances 1984 / “Sovetakan grokh” publ. “The word of love to Armenia” on the words of Av. Issahakian. Col. Armenian choruses” 1986 / “Sovetakan grokh” publ. VAHRAM BABAYAN was born on August 19, 1948 in Yerevan. He graduated from Yerevan Conservatory after Komitas, and studied in piano under professor E. Mirzoyan and in composition under professor G. Egiazarian. In 1992 he has established “Vahram Babayan” Fund. He is the author of many theoretical articles and perform as pianist at concerts. His music is being performed in USA, Japan, Germany, Argentina, Norway and other countries. In 1999, from April up to August, he was on creative tour in Germany. RUBEN SARGSIAN was born on November, 1945. He graduated from the Yerevan Conservatory after Komitas in 1972 in composition. From 1973 up to 1985 he was teaching theory and solfeggio at Yerevan music school No 10. Since 1986 he is a lecturer on harmony and composition at Yerevan Conservatory. Musical works of Ruben Sargsian were performed at all Congresses, Plenary sessions and Festivals, arranged by Armenian Union of Composers within period of 1973 – 1986. His music was performed in Finland, France, Hungary, Czechoslovakia, Germany, Russia. The concerto No. 1 was recognized as the best musical work of Armenia in 1978. He received the Prize of Komsomol of Armenia. VICTOR KHACHATRIAN was born on April 7, 1946 in Yerevan. He graduated from Yerevan Conservatory after Komitas and post-graduate courses in class under professor K. Dombayev. For more than 20 years he has been the leading violinist in Symphony orchestra of Armenian Radio and Television Company, meantime he has performed as the soloist of the Armenian Philharmonic Society. Many solo concerts accompanied by orchestra in Moscow, Leningrad, Kiev, Tbilisi, Riga and Vilnius, in cities of Germany were performed on tours. He was recorded by Radio Company in Yerevan and Moscow. He has laser discs produced in Germany and in USA. From 1988 up to 1992 he was the conductor of chamber orchestra “Ikar” and conducted many new compositions of Armenian composers. At present Victor Khachatrian is the professor of Yerevan Conservatory after Komitas in violin class. At concerts he has been performing as soloist, conductor and a member of ensemble group. ANAHIT NERSISSIAN was born on June 16, 1954 in Yerevan. She graduated from Moscow Conservatory after Tchaikovsky and post-graduate courses in class under professor V. Merzhanov. In 1980, Anahit Nersissian became the Bach International Competition Laureate in Leipzig (the first prize, golden medal). She is the professor of Yerevan Conservatory and carrying out the broad concert activity. In 1992 she was included into jury at the Bach International Competition in Germany. In 1994 and 1996 she was invited as judge to the International Competition after Sergei Rachmaninoff. ARMEN KARAPETIAN was born on January 30, 1964 in Yerevan. In 1981-1986 he studied at Yerevan State University at the Chemical Department. Simultaneously, he attended the Conservatory after Komitas, the department of vocal music under professor S. Danielian. From 1988 Aram Karapetian is soloist of Armenian National Opera House. From 1993 he is giving concerts on tours in Russia, Germany, Switzerland and Italy. From 1997 he has been work-ing under contract at Czech Opera House as a leading soloist and perform as a guest-artist at Opera Houses of Praha, Brno, PiIzen and Olomouts.